Overview: One of the NBAs most gifted young big men. A near 7-footer with a near 7-5 wingspan. Not just tall, but relatively well built too. Has added some bulk to his frame since appearing on the NBA radar. Shows good mobility, but is more smooth than explosive as an athlete. Long strides make him a factor in transition. Matches his athleticism with an outstanding skill set. Could have been a high draft pick after his freshman season at Texas, but opted to return to school. Had breakout years as a sophomore in both the NCAA and the NBA. Named Big 12 Defensive Player of the Year before being selected 2nd overall and subsequently traded to Portland. Has become one of the better players at his position in just three seasons. Posting better numbers now than he did in college. Likely bound for an All-Star game in the not too distant future. Should be locked up into a contract extension soon. Lacks a certain degree of toughness, which manifests itself on the defensive end primarily at times. Offense: Exceptionally talented big man who maintains an outstanding level of efficiency across the board. Gets almost half of his possessions in one-on-one situations, whether they come in the high or low-post. Also sees a significant number of touches in spot situations, off of pick and rolls, and working without the ball. Exceptionally balanced for a post player his age. Has all sorts of offensive tools. Does an average job acquiring position on the block, often receiving the ball in the mid-post when well defended. Shows better strength and significantly more tenacity once he has the ball. Displays all kinds of offensive moves, but prefers to use a turnaround jumper over his right shoulder that allows him to use his exceptionally high release point to get a decent look almost any time he wants it. Gets the majority of his touches on the left block so he can make his move towards to base line. Not ineffective going over his left shoulder. Likes to simply try and turn the corner and go to the rim using his long strides when he turns that way. Shows a turnaround going right, but shoots it with a slow release, almost double clutching the ball on the way up. Displays a nice hook with his right hand as well. Will often use a dribble to back his man down and then take whatever his defender gives him. Will only be over-aggressive in the post if he feels he has a major size and quickness advantage. Displays a good face-up game, tending to take a dribble to the middle and then spin to a turnaround jumper when the defense responds or just shoot the ball immediately. Extremely smooth in virtually everything he does. Still developing his catch and shoot jumper. Not quite as effective when he has time and space from outside of 17-feet as he is with his turnaround when well-defended in the post. Displays decent form, but seems a little hurried at times in catch and shoot situations. Still a definite threat, but would be a nightmare to defend if he improved that part of his game and became merely a respectable threat from three point range. Just as efficient with a hand in his face as he is wide open from the perimeter, and more efficient after a dribble than he is from a stand still a testament to his shot-making ability. Very capable ball handler for a near 7-footer. Almost never turns the ball over in relation to most players near his high usage level. Doesnt get to the line at a very high rate for his skill level, since he makes most of his moves going away from his defender. Still proves to be a very good finisher, using his length and leaping ability to finish his offensive rebounds, cuts to the basket, and transition opportunities with a dunk whenever possible. Runs the court well and uses his mobility very well on the pick and pop. Seldom rolls to the basket after setting a screen, which has more to do with Portlands centers than Aldridge himself. Extremely high level offensive rebounder due to his wingspan, timing, and athleticism. Versatile, skilled, and careful with the ball, Aldridge has room to improve his efficiency, but has became an awesome offensive weapon in just a year and a half. Defense: Capable defender who gives an effort if nothing else. Displays the anticipation to use his length to come up with some steals and block some shots. Not a standout in either area, but is a threat to make some plays. Blocks most of his shots on the ball, though one of his biggest weaknesses revolves around his lack of tenacity when defending the ball one-on-one around the basket. Will let himself get beaten with aggressive drop steps and allows himself to get pushed around more than he should. Doesnt use leverage terribly well. Not a bad defender, but his lack of great energy coupled with some issues with his fundamentals limit him. Has some problems committing to hedging screens, not showing a great sense of urgency recovering to his man and giving up some open looks that hes often still able to get a hand up on by using his length. Does a decent job defending penetration in that he takes away the lane, but tends to be content with defending his matchup from the side when they look to attack the rim, instead of beating him to the spot. Size makes his lack of great lateral explosiveness understandable. Doesnt prove to be a very good defensive rebounder, some of which has to do with the players Portland deploys around him, but is also caused by a lack of aggressiveness when boxing out. Overall, Aldridge plays a position based brand of defense that doesnt sell out his teammates, but hes capable of being more active in the midrange and tougher on the block. Only having played two games in Vegas, it might not be the wisest idea to go completely overboard heaving praise on Aldridge. But considering how good he looked, it was hard not to come away excited. Aldridge showed a package of offensive skills that was unmatched among any big man in the summer league. Hes added a good deal of weight to his frame over the past year, and is now doing a much better job using his body to carve out space in the post and attack the offensive glass. His physical tools are excellent for a player his size, having the extension and coordination to finish with incredible ease from anywhere around the basket, and being capable of running the floor like a guard stride for stride with his ball-handler. Aldridge got many of his points in Vegas just by taking off in transition as soon as his team secured the rebound, and was rewarded on many occasions thanks to his great hands and outstanding agility. In the post, Aldridge can score in a variety of ways. He has a beautiful turnaround jumper from the posthis trademark in college, but can also come off a short curl and knock down a pretty looking shot from 15 feet out. The Blazers ran a lot of pick and pop plays for him out on the perimeter, and Aldridge showed the ability to knock down a catch and shoot jumper all the way out to the college 3-point line, but was quite inconsistent doing so. His footwork can get a bit sloppy and the extremely high release point on his shot means he loses accuracy when hes rushed or on the move. In terms of creating his own shot, he did so both facing and with his back to the basket, utilizing a drop-step going into a jump-hook shot on one occasion, and putting the ball on the floor with his left hand on another. He even showed the ability to pull up off the dribble on an isolation move, which is obviously a highly advanced move for a guy who is 6-11. There is no doubt that his skill level is fantastic for a player his age --having only turned 22 a few days ago. At times Aldridge has a tendency to settle for nonsensedifficult shots from tough angles with a defender draped all over him. His feel for knowing what he can and cant do will have to improve as he continues to mature and gain experience. He still has a tendency to avoid contact at times and not finish all that strong, but to his credit, this looked like much less of an issue than it was when he was in college a year ago. There is no reason why Aldridge shouldnt get to the free throw line 5-6 times a game next season, and that should be a goal of his. Defensively, Aldridge did a very good job in each of the two games he playedusing his length to alter and block a number of shots in both outings and sliding his feet gracefully to stay in front of his man. His potential here has always been extraordinary, and he showed the impact hes capable of making playing off of post-buddy Greg Oden. Those two playing next to each other for the next 10 years or so has to be a scary thought for most Western Conference General Managers. All in all, Aldridge seems to be progressing nicely, and at this point is clearly still scraping the surface on his potential. Reporter: How is your relationship with Chris Bosh? LaMarcus Aldridge: Chris is a great guy, Ive been working out with him every day in Dallas. We both went to high school in Dallas, so we were big rivals back then. Reporter: Does it help working out with Bosh every day? LaMarcus Aldridge: It has been good. It has helped me get used to someone who is as athletic and long as me, and someone who has stronger than me. Reporter: Do you see yourself as a big forward or a center? LaMarcus Aldridge: I think I see myself as a combination between a five and a four. My natural position is probably a four, but I can play with my back to the basket and do a lot of different things, so probably a combination. Reporter: Do you think that the way the traditional center is kind of going away in the NBA is going to help you in this draft? LaMarcus Aldridge: I think so. Big men these days have to run the pick and roll and shoot the 15-footer all day, so I think that helps me. LaMarcus Aldridge: Of course it is, no one wants to lose. We play a lot of one on one, and it is helping me get used to playing against someone that is longer than me and quicker than me. He is an all-star so if I can get used to playing against him, I think Ill do alright. Reporter: How does playing with Bosh in Toronto sound? LaMarcus Aldridge: It sounds alright. Hes a nice guy and he plays hard, so I dont think playing with him would be such a bad thing after all. Jonathan Watters: What teams have you worked out for? LaMarcus Aldridge: At this time, I havent worked out for anyone. Reporter: Are you going to work out in Toronto? LaMarcus Aldridge: I dont know. I let my agent handle that. Jonathan Watters: If Im an NBA GM, why do I pick you number one? LaMarcus Aldridge: I will go out and compete every night and try to win. I work well with my teammates, and will work hard to get better every year. Jonathan Watters: Who are the players that you pattern your game after? LaMarcus Aldridge: I try to do it after KG, but also Tim Duncan, because I like to face up and shoot the jumper, but I also can use the jump hook. Reporter: How tall are you? LaMarcus Aldridge: With shoes, Im 611. Reporter: What are you weighing in at? Jonathan Watters: Have you put on weight since the end of the season? LaMarcus Aldridge: Im probably about the same. Reporter: Do you think you need to put on weight to play in the NBA? LaMarcus Aldridge: Everybody says I need to put on strength, that I need add 10-15 pounds, but KG isnt 275. Hes wiry, and hes strong enough to compete. Jonathan Watters: What do you think you need to improve on? LaMarcus Aldridge: Just on my skill work, playing the pick and roll because that is what the NBA is about. Ive worked hard on understanding the game, my court vision, knowing when I should fight for position, when I should set a screen, when I should go to the other block, all the little tricks of the trade that I can use. Reporter: What is your biggest challenge? LaMarcus Aldridge: Looking back on the season, I think I played well against 4s like (Kevin) Pittsnogle, but I think getting used to the banging night in, night out will be the biggest transition. Jonathan Watters: What is one attribute of yours that youll be able to use right away in the NBA? LaMarcus Aldridge: Beyond my mobility, I would say my sky hook. Thats the most unstoppable shot in the NBA, so I feel like if I went out tomorrow I could get my sky hook off on anybody. Reporter: How much of a goal is it of yours to go number one? LaMarcus Aldridge I really havent gotten into it much. Im just working out. I think getting drafted is a blessing, so if I end up going two or three, I wouldnt be disappointed. Jonathan Watters: What style of play do you think you will fit in best with in the NBA? LaMarcus Aldridge: I think I can fit in with any style of play, but I think a faster paced team that wants to get up and down and run the floor, I fit in well with that. Jonathan Watters: We know your agents are handling all your team workouts, but would you personally like to matchup against some of the top guys in a competitive workout? LaMarcus Aldridge: I really dont want to get into that. My agent has been doing this for a long time, so I let him handle that. For the second time in the NCAA tournament, Aldridge followed a dominant performance with a no-show, playing very tentatively against the much bigger Glen Davis and the super-athletic Tyrus Thomas. Aldridge proved that he will need to continue to add bulk to his frame, as Davis took him out of position with his width and strength the entire game. His shot wasnt falling either, and rather than attacking the basket to try and draw contact, he settled for fadeways and turnaround jumpers throughout the entire game. On the defensive side of the ball, he was better, though he found himself caught out of position a couple times, which lead to easy hoops for the LSU bigs. Aldridge did use his length to block 5 shots, however, 3 of them coming on Davis, and was pretty good handling the glass with the exception of a few instances in which he didnt go up strong enough for the rebound. He made a few small fundamental errors that young big men often make, including bringing the ball down on an offensive rebound rather than holding it high and going right back up to the hoop. This off game came at the worst possible time for Aldridge as well, considering we now know it was his last game of the season, and his struggles came against some NBA-caliber big men. Though he struggled against LSU, Aldridge proved throughout the season that he possesses all the raw tools necessary to become a dominant NBA big man. His use of these tools has been inconsistent throughout the entire season, but he is still young and improving as a player. Aldridge is in a good position to declare for the draft and take advantage of the potential he has displayed throughout the season, although he has been implying that he might not. A couple bad performances here or there dont take away from the player that he can become, but it does lead us to believe that it will take him some time to establish himself as a legit presence in the NBA. After struggling against N.C. State in the last round of the NCAA tournament, tonight LaMarcus Aldridge again looked like the player that has been touted as the #1 pick in the draft for the majority of the college season. Aldridge started the game by asserting his position in the paint and making a beautiful pass to an open PJ Tucker for the layup. He continued by putting on a mid-range shooting clinic, making a variety of impressive jump shots from about 15 feet out both on the move or from static positions. Some of these shots were off balance turnarounds where Aldridge just sensed where the defense was and turned and shot the other way. He finished the first half a perfect 8 for 8 from the field with 16 points. Aldridge continued his impressive display in the second half, despite the fact that West Virginia was much more keyed in on stopping him. He fought hard for position and made some good passes out of double teams to the open guard on the perimeter, a skill that will certainly help him when he is playing in the NBA. Down the stretch, with the game close the whole way, Aldridge called for the ball every time, and managed to score off of putbacks, jumpers, layups and hard fought offensive rebounds. Aldridge did nearly everything the Longhorns could have asked from him in the biggest game of his young career so far. Though he had a great overall game, Aldridge did miss half of his free throws, including one with 14 seconds left that would have iced the game for good. Though he struggles at times from the free throw line (65% this season), Aldridge has a very nice shot from mid-range, so theres no reason why this part of his game shouldnt improve. Against West Virginia, Lamarcus Aldridge had the type of big game that players need to have to warrant consideration as the top pick in the draft. He displayed his plethora of moves on offense, as well as outstanding rebounding potential. To lock up the position as the top pick in the draft, Aldridge will need to continue to play big in the remaining games of the NCAA Tournament. From the start of the game it was quite obvious that this wasnt going to be LaMarcus Aldridges day. He struggled for position inside, and a few times fumbled entry passes which led to turnovers. When he was able to get the ball, Aldridge rarely finished his move, and often settled for mid-range jump shots which just werent falling today. After his opening round game, where he was demanding the ball in the post, Aldridge looked passive, and didnt establish himself nearly as well. On a couple occasions, he even had his shot blocked by the much more aggressive and emotional Cedric Simmons. On the defensive end of the ball, Aldridge bit on pump fakes, which allowed smaller players to score in the paint. Though the Longhorns won by a large margin, this is a game that Lamarcus Aldridge wont want to remember anytime soon. Before the NCAA Tournament, we said that Aldridge would best help his draft stock by showing a bit of a mean streak and consistently showing up at the top of his game. He has done neither of these things thus far, and the spot atop the draft board looks as wide open as ever. If he can bounce back and become the main guy for Texas over the next couple of games, it would help Aldridge greatly, but more inconsistent play will leave his draft stock a bit up in the air. Throughout the season, Aldridge looked dominant at times, but still made many question his consistency and ability to be the number one option in big games. Aldridge answered the second question tonight by leading Texas over a pesky Penn team. Aldridge started out the game in dominant fashion once again, scoring 8 of his teams first 9 points in the opening 9 minutes of the game. Playing very unselfishly, he didnt force any bad shots, and passed out of the post when he was double teamed, which lead to some good ball movement and easy shots for teammates. In the second half, Aldridge continued where he left off, scoring efficiently and unselfishly, and finished the game with a double-double. In addition to the good numbers, Aldridge started showing a little bit of passion. Playing passively has been a knock against him for the entire season, so coming out with some intensity is very helpful in his chances of being the top pick in the draft. If he can come out and continue to lead Texas with some aggression through the rest of the NCAA tournament, it will vastly improve his chances of hearing his name called first at the draft in June. After having his freshman season cut short due to injury, Aldridge has clearly established himself as a top 3 prospect throughout his sophomore campaign. He has been inconsistent this year, however, and a strong showing in the NCAA tournament might be necessary for Aldridge to be the number 1 pick in the draft. He started the season with 6 consecutive double-doubles, but has seen ups and downs since then. Aldridge finished up the Big 12 conference tournament last week with a game against Kansas where he was virtually invisible, posting 5 points and 5 rebounds, while struggling with foul trouble in 28 minutes. Some of Aldridges inconsistent performances can be attributed to the guards he plays with, as they often ignore his perfectly established position in the post. At some point, however, a player with Aldridges tools on the offensive end of the floor must demand the ball when he works himself into position. To this point, we havent seen this aggressiveness from Lamarcus Aldridge yet this season. In order for Texas to make it to the Final Four, Lamarcus Aldridge will have to be a dominating presence inside. As a start, he must rebound the ball well. Aldridge averaged 9.4 rebounds per game in wins this year as opposed to 7.5 boards per game in losses, and had single-digit rebounds in 4 out of the 6 Texas losses this season. In addition to rebounding, Aldridge must maintain focus on defense, and avoid foul trouble while doing so. The best thing Aldridge can do to help Texas in the NCAA tournament is develop a mean streak, which would help his game in all aspects. As it is, Aldridge is a very talented player who shows flashes of brilliance and talent. But his performance in the NCAA tournament will say a lot about his character and leadership abilities, and if he utilizes his talent, we could hear Lamarcus Aldridge as the first name read at the draft in June. Aldridge possesses all the physical characteristics NBA GMs dream about in a big man. He has terrific size for an NBA big man at 6-11 or possibly even 7 feet, long arms that extend almost to his knees, and all-star caliber athletic ability. Aldridge is a quick and fluid player who moves like a ballerina and runs the floor like a guard. He is extremely coordinated for his size, and possesses a vertical leap that allows him to spring high off the floor in the blink of an eye. In todays modern NBA that is so much more reliant on quickness and athleticism rather than brute strength, he has the ability to play either the 4 or the 5 spot for his team depending on where he is drafted. Offensively, Aldridge is about as talented and versatile as you can ask for out of a big man, but at the same time is also fundamentally sound. It is obvious that he was well coached as a youngster. He already has a number of silky smooth go-to moves in his arsenal that are downright impossible to stop at this level, mostly of the finesse type. The first would be a terrific jump-hook shot. Aldridge sets up shop on the baseline anywhere out to 15 feet, catches the ball, spins to either shoulder, squares them simultaneously, elevates gracefully with one hand underneath the ball and flicks his wrist at the height of his leap with a soft touch. All in one quick, fluid motion. The second would be his turnaround jump-shot. When he doesnt have the strength or will to back his man all the way to the basket, Aldridge can catch the ball, spin and fade away quickly, elevate straight up off the ground and get high enough to give him all the time in the world needed to knock down his shot with deadly accuracy. Both of these moves are simple and fundamental, but Aldridge executes them perfectly and has the perfect physical characteristics to make them nearly unblockable. Watching him practice these moves, there is little doubt that he has spent some time studying tape on Kevin Garnett. Since Aldridge appears to be used to playing with guards who often have absolutely no idea how to get him the ball in the paint, he is able to step outside and do some damage from there as well. He has a beautiful jump-shot with range out to about 18 feet, but has looked to rely less on this part of his game over the past few years, which is certainly a good from a player his size. With that said, having the ability to punish his man with a jump-shot makes him that much more versatile and dangerous. Being a player who runs the floor like a deer and often beats guards down the floor with his huge strides, he is obviously a lethal finisher in transition. But he is also skilled and smart enough to not be a liability with the ball in his hands here, and can even do some ball-handling of his own, either to finish smoothly himself or find the open man. If you dont box out on the defensive end, hell get off his feet instantaneously and flush the put-back down emphatically. Aldridge is not just able to get up and down the court in the blink of an eye; he is also quite willing as well, as he doesnt seem to tire easily. He is tough to get a body on in the paint because of his quickness and executes his moves fluidly enough that a smart guard can just run the floor with him, set him up in the paint with a good post-entry pass and walk away knowing that he will finish the play or get to the line. Aldridge gets low to the ground to catch the ball and can surprise his rival by elevating quickly and strongly for a soft finish off the glass. His reflexes are superb and his hands are good enough to let him catch nearly anything that is thrown his way as long as he isnt being pushed around too much. At the line, Aldridge has all the makings of a very good free throw shooter, thanks to the perfect mechanics on his shot. Defensively, Aldridge has extremely quick feet and the coordination and reflexes to react to most situations. His length, leaping ability and mind usually do the rest at the college level, blocking a decent amount of shots and altering countless others. In terms of rebounding, the same can be said. He has the physical gifts needed to simply outquick and outleap rivals in and out of the paint. This allows him to pull down double digit rebounds most games, many out of his area, without really breaking a sweat. In terms of intangibles, everything Ive heard and seen says that he is a great teammate both on and off the court. At times you can tell that he wants to be somewhat of a leader on his team, but just doesnt know how yet. He is very unselfish, almost to a fault at times, but looks very good moving the ball around in a set offense, especially passing out of the double team. It wouldnt be a stretch to say that the game comes easy to him and that he is just now beginning to scrape the surface on his vast potential. At age 20, Aldridge still hasnt fully grown into his frame and therefore is not yet strong enough to maximize his ability on both ends of the floor. Stronger opponents (as Shelden Williams has shown) can push him off the block and prevent him from getting into a groove offensively. He allows his man to front him on offense occasionally and will not be active or aggressive enough to punish him for it. The same goes with his defense and rebounding, not having the strength to establish position deep in the paint and fight off his man simply with his athleticism. Offensively, Aldridge doesnt even look for the ball on certain possessions. He will post up, seal off his man, and look right at the guy with the ball, but wont absolutely demand it. This problem is compounded by the fact that he doesnt have a point guard on his team. At times he will be wide open and his guards simply can not find a way to get him the ball in time with a simple fundamental bounce pass. Despite this happening several times a game, Aldridge refuse to show frustration when almost every other talented back to basket big man certainly would. This tells you a lot both about the type of player and teammate he is. He is too passive at times considering how talented and just how much better he is than everyone else on the floor. Aldridge is also not consistently aggressive enough as a defender or rebounder. He is good enough to be a very solid starter in the NBA just off his talent, but developing a real mean streak could make him into a superstar down the road. Like many young players, his motor is inconsistent and he can go for certain stretches without making his presence felt on the game. It would be nice to see him being more active at times rotating on defense and hustling for rebounds. He often relies on his hands and athleticism more than he does on his body in terms of boxing out and fighting for position defensively, but this could be partially due to a lack of strength. With his physical gifts, he has much more potential as a shot-blocker than he has shown at this point in his career. He doesnt seem to have the mentality, instincts or go-to-itiveness of a Dwight Howard or Marcus Camby type player. Many wonder whether he is soft, both mentally and physically. With the way he plays on both ends of the floor, sometimes you have to wonder if Aldridge is just too nice for his own good. He has the tendency to go easy on his matchup when the game is in hand, not really having the demeanor of a player that wants to dominate everyone he goes up against. He is so smooth and effortless in everything he does that it doesnt always look like he is giving 100%. Watching him play, you might have the feeling that he just doesnt have any idea how good he can be in the future. More than anything, Aldridge is still an inexperienced player. He only played in 14 games as a very raw freshman, and has very little big game experience to speak of at the time of this report. His performance in March will tell us something about his character and maybe about the type of player he can become in the future. 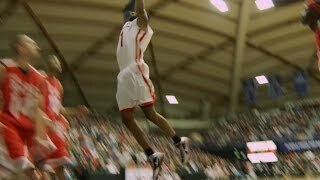 In high school, Aldridge was considered a top 10 recruit and was named a McDonald's All-American. Now, Aldridge plays in the Big 12, a pretty physical and athletic conference that has a decent amount of size for him to match up with. As a very skinny freshman in his first 14 games he started off slowly and looked like he clearly had quite a bit of work ahead of him. Regardless, you could see that he had a lot of talent and was just beginning to really show it when he went down for the season with a hip injury that required surgery. He came back bigger and much stronger as a sophomore and racked off 6 straight double-doubles (including against nationally ranked West Virginia and Iowa) to announce his return to the entire country. He had a tough outing in a blowout loss against Shelden Williams and Duke (scoring most of his 21 points in garbage time) and has been putting up big numbers since then. Foul trouble, the full-court press and Texas guards hampered him in a win against Memphis, but he has been very solid ever since. Texas appears to be cruising through the Big 12 and looks like they are on their way to a very nice seed in the NCAA Tournament. His play there could ultimately cement his place as the #1 pick if he can find a way to dominate and lead his team deep into the tournament. With his physical characteristics, versatile offensive game, talent and intangibles, Aldridge is in a class of his own in this draft. Almost everything he does screams of upside. He has the potential to be a star and will be drafted in a position that is appropriate to that. Barring an injury or an absolute collapse in the NCAA tournament, he looks like a lock to be drafted in the top 5 and is as good a candidate as any to go #1.